These uniquely flavored dips are sweet and zesty! Great with pretzels, chips, or crackers, as an appetizer or snack for parties. In our gift shoppe, we can't keep them on the shelf once our customers try a sample. Comes in several distinct flavors; Red Raspberry, Orange, Key Lime, the Original Honey Mustard and a Pub Beer Dipping Sauce that's awesome in flavor. FLORIDA ORANGE HONEY MUSTARD - The taste of orange mixed with honey mustard makes a delightful flavor. Great with chips or pretzels. A superb glaze for ham or chicken, a real flavor enhancer. HONEY MUSTARD - A sweet flavorful combination of honey and mustard great for pretzels or any other crunchy snack. Fabulous for any occasion - casual or formal. Try it as a glaze on your next gourmet dish. KEY LIME HONEY MUSTARD - Key Lime and Honey Mustard, what a combination! The taste is amazingly refreshing and tantalizing. This sweet and zesty taste is great with crackers or chips, as an appetizer or snack. PUB BEER MUSTARD - Wow! This great tasting dipping sauce is a real hit. Your pretzel's won't know what hit them. It's snazzes up the regular Honey Mustard Dip so much you won't be able to stop dipping. Disappears fast! Yummy! 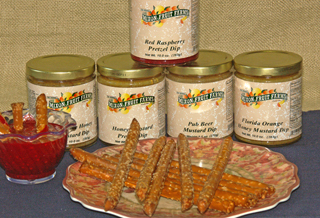 RED RASPBERRY - A sweet yet tangy treat that you can't keep your pretzels out of. This is not a combination that you would ever think of, but once you try it, you'll never want to eat pretzels any other way.